Sometimes things just work out. This was one of those times, pre-dawn a massive rain front came through, I was sitting in the car cursing getting up so early, I could be in bed warm and dry. The rain moved through, the wind dropped, it was going to be a beautiful spring day. Shot on the Panoramic 617 film camera for optimal printing at any size you desire. 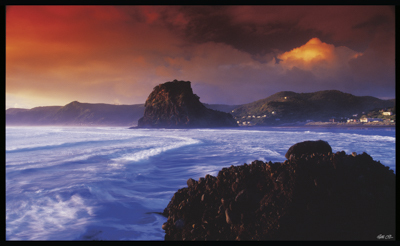 This image features in The Big Little Beach Book.